Courts megastore in Tampines reopens after two months of renovation works. The redesign is part of a $10 million investment to refurbish all of its islandwide retail stores. At the revamped Courts flagship megastore in Tampines, which opens today, customers can experience its goods in a friendlier, more interactive environment. First to go was the hoarding that previously covered the floor-to-ceiling windows - creating a flush of natural light that brightens up the entire three-floor, 136,000 sq ft retail space. At the Home Gallery on level two, there is a showroom space that displays the latest furniture, bedding, electronics and accessories, complete with package prices if you want to buy the whole set as is. 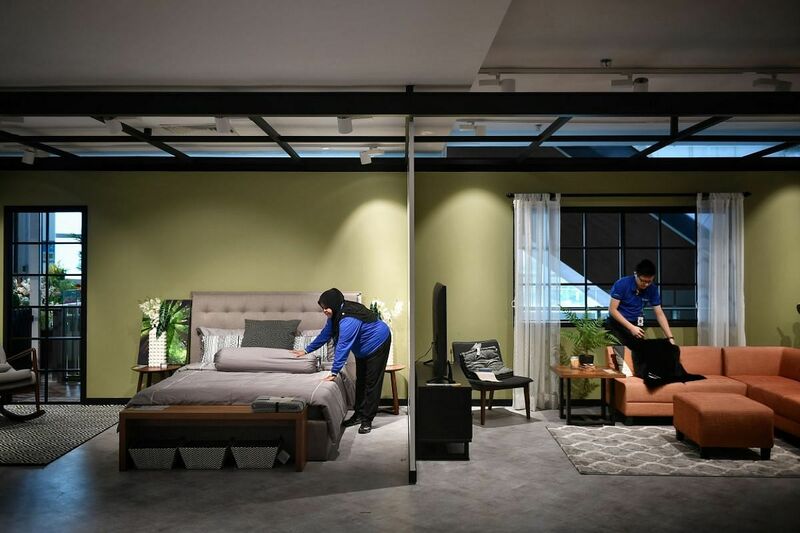 On the same floor, there is another true-to-size replica of a four-room HDB flat and studio apartment showroom that has been integrated with smart home automation such as mobile-phone controlled lighting fixtures to inspire ideas for your home. In the furnishing department on the same floor, you can get a feel of fabrics. Customers are free to take home fabric swatches and sofa vital stats cards so they can compare colours, fabrics and styles with pieces they already have at home. In the gaming zone on level three, you can test out the latest gaming equipment and browse through gaming concepts by Sony PlayStation, Microsoft Xbox and Nintendo Switch. Courts, a furniture and electronics giant with roots as a furniture retailer from Britain, was established in Singapore in 1974. Today, with 14 outlets here, it is the newest brand to jump on the experiential retailing bandwagon. Experiential retail describes the increase in interaction that people have in retail spaces - allowing customers a chance to touch, feel and experience products before committing to them. It is a trend that has sprung up in response to the growth of online shopping and fewer people visiting physical shops. In Singapore, other electronics and furniture shops have also upped their game to entice customers to linger in their stores. Home-grown electronics chain Gain City opened its 500,000 sq ft megastore in 2015, offering more than 100,000 sq ft of retail space. Besides frequent shuttle buses to two MRT stations, the store also has thoughtful touches, such as gaming areas to keep children occupied and open-plan kitchen concepts that offer live cooking demonstrations every weekend. Australian furniture and electronics giant Harvey Norman is another retailer that has followed suit - it reopened its 100,000 sq ft flagship store at Millenia Walk in 2015 and extended the revamp to its store at Parkway Parade, which opened in August. Following a four-month renovation and expansion, the 34,000 sq ft Parkway store features modern finishings and dedicated interactive areas such as a games hub and a photo shop. Mr Keda Albano, 50, regional head of visual merchandising at Courts Asia and the man behind the overall refreshed aesthetics of the new megastore, says: "Retail showrooms of the past often lacked a sense of warmth. Australian furniture and electronics giant Harvey Norman opened its 100,000 sq ft, three-storey flagship store in Millenia Walk in 2015, followed by a revamped 34,000 sq ft store in Parkway Parade in August this year. Both spaces feature a brighter and more spacious layout, with modern finishings such as exposed brick walls and shelving with black railings. There are also dedicated experiential areas such as a games hub, which carries a comprehensive range of gaming hardware, titles and consoles. Areas of the stores have also been recreated to look like parts of a home, so customers can envision how the products will fit in their own homes. The Gain City megastore in Sungei Kadut opened in 2015 and offers more than 100,000 sq ft of retail space, which houses all the store's offerings under one roof - including its air-conditioning business, consumer electronics arm and its newest foray into home furnishing. To create an interactive environment in the store, most appliances are plugged in and functional, which means they can be tested before they are bought. There is a gaming area to keep children occupied, a cafe and foodcourt, and open-plan kitchens, which offer live cooking demonstrations every weekend. Gain City also offers a personal shopper service, which can be booked online or over the telephone. Staff will help customers select items for their home based on their budget and needs. "They were usually geared towards just showcasing merchandise without any thought about the customer journey. "With the revamp, what we wanted to do was blur the lines between residential and retail and create a sense of place that is more home than store." With its new woody, industrial chic interiors, more spacious layout and new experiential zones, the renovated store aims to create a welcoming place for customers to try out merchandise and to get new ideas. Inspired by other retailers in places such as Sydney, Tokyo, Las Vegas, California and London, the Courts team spent a year researching how its brick-and-mortar stores could deliver an experience that customers could not get online. The company has invested $10 million to refresh the interiors of all its outlets islandwide, with the most dramatic being the Tampines megastore, which is also its largest. Mr Ben Tan, 49, chief executive of Courts Singapore, says: "What we wanted was to meet the higher expectations of discerning consumers and really value-add - by making the in-store shopping experience pleasant and offering services that help customers not only before, but also during and after they purchase an item from us." For example, floor staff have been trained to offer more than just product information and are encouraged to give customers styling tips. They will also point out pieces of furniture or appliances that might work well with other purchases. 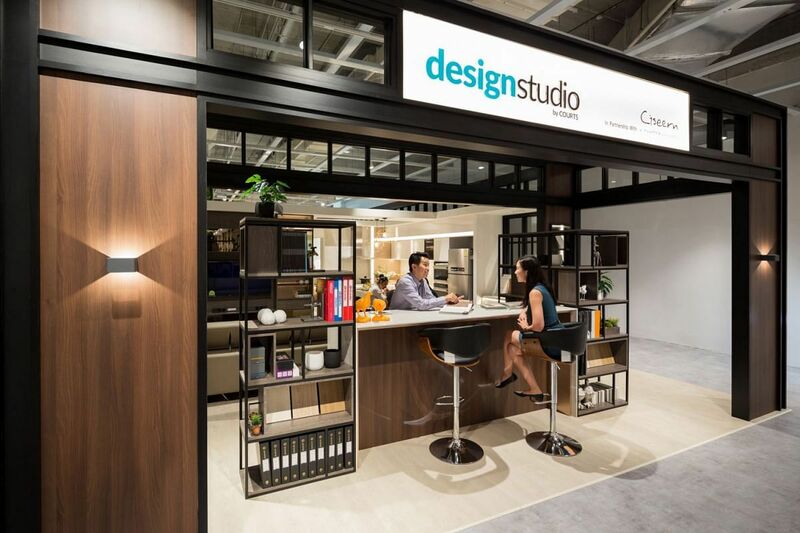 Consultants under the Design Studio by Courts concept - a partnership between Courts and two award-winning interior design firms, Ciseern and T-Werkz - will advise customers on interior design, renovation and furnishing. Should you have issues post-purchase, Courts' Guru service offers more than 100 repair and maintenance services for over 20 home product categories, including smart homes link-up, mobile phone and laptop repair, sofa cleaning and washing machine servicing. Some home owners are already looking forward to the new shopping experience. Self-professed bargain hunter and accountant Daisy Lim, 32, who bought her four-room HDB flat two months ago,is attracted to the idea of "see(ing) products in action, especially investment pieces such as furnishing or electronic appliances". "From the sound of it, Courts is now retailing in a way that allows customers to interact with items and better imagine how they could work in their home," she says. "That, to me, renders the product more valuable than just looking at it on a screen and I'm more likely to want to buy it in the end."